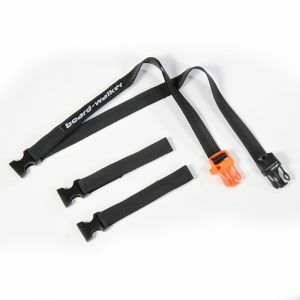 board-walker is a strap that attaches to the front binding by means of an orange ‘click-on’ whistle buckle (as a rescue/safety aide). It attaches around the riders front leg by another adjustable buckle, to become a leash. When ‘unbuckled’, board-walker offers a loop handle and is long enough to become a lead, so that the snowboard can be pulled over the snow. When ready to carry the snowboard, the strap is then clipped onto the back binding to become a carry strap for the shoulder. Board-Walker is an ‘all-in-one’ snowboard leash, lead and carrier is a light strap that attaches to the snowboard by ‘click-on’ buckles. It is quick and easy to use, and incorporates a whistle buckle that offers a rescue /emergency function.